Recovering gait function after a neurological injury such as a stroke or a traumatic brain injury is a major goal of rehabilitation. Gait is a key motor task for activities of daily living and the ability to walk independently is important for quality of life. Consequently, a great deal of effort has been devoted to developing effective gait training interventions. One approach that is widely used in individuals requiring assistance walking is training patients on a treadmill while providing weight support via a harness and manually guiding a patient’s limbs. For therapists, this technique can be both labor intensive and potentially injurious. As a result, researchers and R&D engineers have begun to focus on an easier and more effective rehabilitation technique – robotic-assisted treadmill gait training. The first robotic systems were designed for adult populations with spinal cord injuries but there is now a growing interest in using this technology for children with conditions such as cerebral palsy. Our group at Spaulding Rehabilitation Hospital in Boston, Massachusetts and the group led by Dr. Meyer-Heim at University Children’s Hospital in Zurich, Switzerland have been the first to study robotic-assisted treadmill gait training in children with cerebral palsy. Preliminary results are encouraging. Our own results, consistent with results published by Dr. Meyer-Heim’s research group, show average improvements in gait function of 20-30% when using clinical scales such as the Gross Motor Function Measure Scale or using clinical measures of gait speed and endurance such as the 10-meter walk test and the 6-minute walk test. There is one caveat, however. Whereas average group results demonstrate large improvements in walking ability in children following robotic- assisted treadmill gait training, a closer inspection of results on an individual basis shows a large variability in response to the intervention. This observation has caused a major effort by several research groups aimed at optimizing training procedures on an individual basis. Why do some children respond positively to robotic-assisted treadmill gait training while others don’t? Is it because children who respond to gait training are different at baseline from those who do not respond? Is it because the training procedures are not properly optimized for all children? Would an individualized training approach lead to positive rehabilitation outcomes in all children? These are the questions we need to answer in order to identify all potential sources of variability in children’s responses to robotic- assisted treadmill gait training. One area, among others, that is currently under investigation in an attempt to answer the above questions is the matter of how engaged a child may be during training. The team led by Dr. Meyer- Heim at University Children’s Hospital in Zurich and our team at Spaulding Rehabilitation Hospital in Boston have explored the possibility of increasing a child’s involvement in robotic-assisted treadmill gait training by using interactive games. Fig. 1 shows the setup both groups have used. 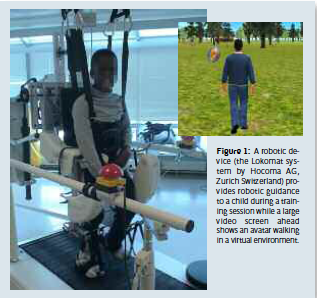 A robotic device (the Lokomat system by Hocoma AG, Zurich Switzerland) provides robotic guidance to a child during a training session while a large video screen ahead shows an avatar walking in a virtual environment. Dr. Meyer-Heim’s research team has performed an assessment of the above-described technique based on measures of the magnitude of the forces generated by children walking in the robotic system with the use of the interactive game versus those without. This is an intuitive and reliable measure of the level of engagement of the child during the training session. The results show that patients generate forces of larger magnitudes (i.e. are more engaged in the training session) when using an interactive game. Our own study shows similar results. A case series led by Dr. Patritti at Spaulding Rehabilitation Hospital indicated that better outcomes are achieved when interactive games are used along with robotic-assisted training. In the study, we compared results achieved in children with cerebral palsy using the robotic system combined with interactive games with the results achieved when the robotic system was used on its own. In kids using the interactive games, we observed larger improvements in walking function (as measured using the Gross Motor Function Measure scale), walking speed (as measured using the 10-meter walk test), and walking endurance (as measured using the 6-minute walk test). The above-summarized results are preliminary and need to be confirmed by future studies on large groups of children with cerebral palsy. However, additional factors are likely to play an important role in gaining a better understanding of how robotic- assisted treadmill gait training should be modified for better outcomes. An intriguing factor affecting motor gains using the treadmill is the baseline ability of the child to respond to the interaction with the robot. This is a fundamental question concerning if and how motor learning can be achieved via interaction between the robot and the subject. To further explore this question, our group is conducting an experiment on the lower limbs that was originally designed to understand motor adaptations of upper limb control. The original experiments were performed by Dr. Mussa-Ivaldi and Dr. Shadmehr, and showed that healthy subjects respond to perturbations introduced by a robot during arm reaching movements by generating a force that compensates for such perturbation. They also showed that the magnitude of the force generated by subjects to compensate for the perturbation introduced by the robot decreases gradually over time once the perturbation is removed. Our own study using the same principle was translated to the lower limbs and paralleled observations previously gathered for the upper limbs. Now a question of great interest is whether such an ability to adapt to perturbations introduced by robots is maintained in children with cerebral palsy. An intriguing hypothesis is that only children who have maintained such ability have the potential to respond to robotic- assisted treadmill gait training. Future studies are needed to confirm this hypothesis. A final question intriguing researchers is whether the lack of positive rehabilitation outcomes in certain children is due to an inability to translate improvements they achieve during treadmill training to level ground walking. In other words, should robotic- assisted gait training on a treadmill be combined with robotic-assisted gait training over ground? Researchers are attempting to address this question by developing exoskeleton systems for gait training. An example of such systems is the Active Knee Rehabilitation Orthotic Device (AKROD), developed by Dr. Mavroidis’ research team at Northeastern University in Boston, that we are currently testing at Spaulding Rehabilitation Hospital. Though results are still preliminary and challenges still exist, the first commercially-available exoskeletons are now coming to market (e.g. the Tibion Bionic Leg and the eLeg exoskeleton by Berkeley Bionics). This suggests that we will soon achieve better gait training results in children with cerebral palsy as well as in adults with neurological conditions such as stroke or spinal cord injury. Thanks to progress in robotics and the science of gait training, we hope to soon see the day when mobility is not hindered by disability.